There are little pockets of greenspace hiding in every community, often overlooked, ignored and sometimes left to go totally wild. Where do you find these hidden gems? Find your nearest church or burial ground and take a walk around along the paths, between the graves. 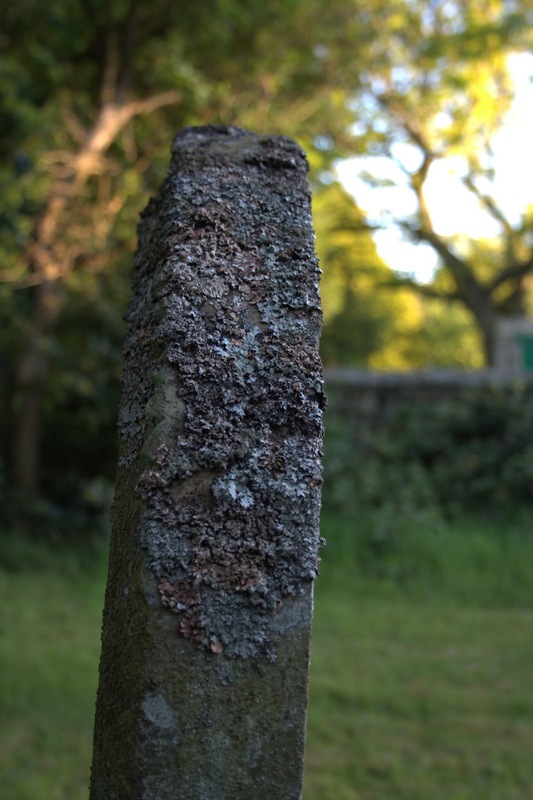 Churchyards are often have old, veteran trees, the gravestones are a good habitat for mosses and lichens and the peace and quiet provide a home to all sorts of wildlife as well as allowing people a place for quiet contemplation and space to think away from the noise and hurly-burly of everyday life. The second week in June is Cherishing Churchyards Week organised by Caring for God's Acre, it is intended to celebrate churchyards and burial grounds and to raise awareness of the treasures they contain. Goathland church, nestles in a fold of the land at the southern end of the village, it stands foursquare and hunkered down against the elements. I walk through the churchyard regularly on my evening dog walk sometimes straight through along the path other times wandering along the wall edge and between the graves. As part of my 30 Days Wild Challenge (see my other do something wilds on the blog here) yesterday evening I took longer than usual through the churchyard taking time to absorb exactly what's there, seeking out details I had previously not noticed. The congregation have regular Churchyard Tidy Up sessions but allow the older sections to grow uncultivated, that's not to say uncared for. By one of the gateposts there are a lovely little collection of forget-me-not, buttercup, dock and nettle, further round on the moorside of the yard you'll find lady's bedstraw in the grass, and if you look at the grass carefully you'll see it's not lawn turf but a mix of cultivated and wild moorland grass with some small sedges too. Where the grass remains un-mown on and between the closer graves there's a riotous tangle of wild carrot, cow parsley and milkmaids and at this time of year a few last bluebells (English ones not Spanish!). The village doesn't have many trees because the free roaming sheep nibble them down to stumps but in the churchyard, where they're protected, several different species grow including the traditional yew, a young oak, several typical moorland rowan (I'm sure it's not entirely coincidence that there's one by the gate!) and a lovely stand of whitebeam which flash their pale leaves in the gentle breeze. Wildlife is encouraged and although the bat boxes have disintegrated after many years of unuse the bird boxes are still on the trees; compost heaps against the wall and under one of the bigger yews are alive with insects and if you're lucky maybe even a slow worm or two. Sit on one of the benches at dusk and you'll be treated to a bat or two (pips mostly but also a long-ear sometimes) darting around feasting on the clouds of midges. I was hoping for lots of lichen but I was surprised to find only a few patches of the crusty, flat forms, hedges elsewhere are covered with the foliose forms, but these are closer to the steam train line and they seem to prosper in the smoke. The older stones under the trees had the best aggregations.